Grade board, skirt board, and splash board are all similar names for the treated lumber nailed at grade around the perimeter of the building. 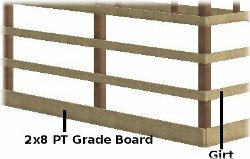 Grade board is typically 2x6 or 2x8 lumber treated to UC4A specifications. This product is treated for ground contact but not embedment. Find the corner post with the highest grade. Set the building grade here by setting a nail in the corner post. Place a nail in each post around the building maintaining a perfectly level string line or laser. Install grade board with 20D nails, setting the board on top of the grade nails temporarily placed around the building perimeter. Leave a small gap between skirt boards to allow for expansion and contraction as temperature changes occur.